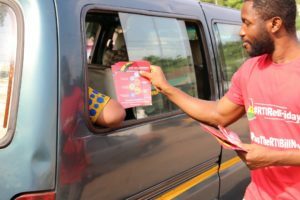 Circle and Ridge roundabout to engage with citizens on the importance of an RTI law. 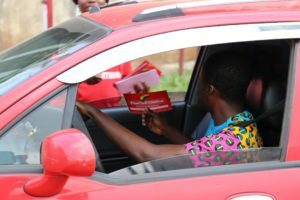 Citizens responded to the call to wear red and share their pictures on social media using the hashtag #RTIRedFriday. 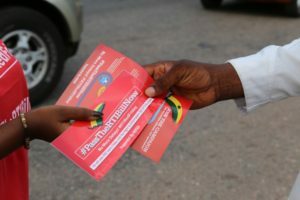 The hashtag emerged first on the Ghana trends on Twitter for the greater part of the day. 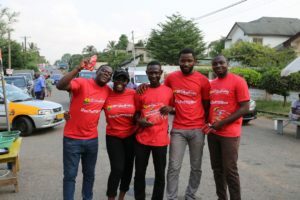 Morning show hosts and staff of media house accross the country who were claded in red attire shared their pictures too, with most media houses giving coverage to the day's action. 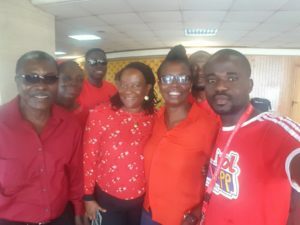 The morning's activities were climaxed with a visit to Parliament by Leaders of various CSOs, senior journalist, and other prominent social commentators who wore red attire to sit in the public gallery of Parliament to observe proceedings. Some of these CSO heads and representatives were held outside the Chamber Block of Parliament by the Parliamentary Security for about 45 minutes because the Acting Marshal of Parliament (Head of Security) claims he was not copied in the letter from the Public Affairs Department of Parliament acknowledging the intended visit by CSO heads. 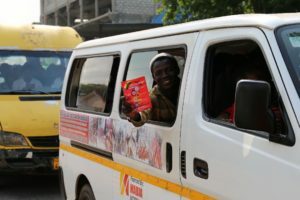 It took the intervention of the Minority Leader to have the Marshal relax his stance since Parliament's Acting Director of Public Affairs was not present at work to speak to her letter. The CSO/Media delegation to Parliament addressed over a dozen pressmen and women after a disappointing sitting day in Parliament where the RTI Bill was not considered, making it two weeks straight since the last day the Bill was considered by Parliament. 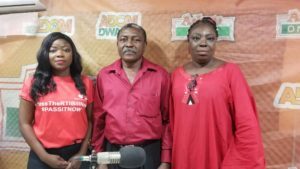 The press conference was addressed by Lawyer Akoto Ampau, a senior legal practioner and long-standing member of the RTI Coalition. Participating in this visit to Parliament were Clara Kasser-Tee and Samson Lardy Ayenini (Private Legal Practitioners), Mary Addah (Programmes Manager, Ghana Integrity initiative), Beauty Emefa Narteh (Executive Secretary, Ghana Anti Corruption Coalition), Shamima Muslim (Convenor, Alliance for Women in Media Africa), Alex Tetteh (President, Centre of Employment of Persons with Disabilities), Gloria Hiadzi (Executive Secretary, Ghana Independent Broadcasters Association), Mina Mensah (Head of Africa Office, Commonwealth Human Rights Initiative), Juliet Amoah (Strategic Director, PenPlusBytes), Gilbert Boyefio (Coordinator, Media Coalition on RTI) Sammy Obeng (Executive Director, Parliament Network Africa), senior officers of Sight Savers Ghana, and representatives from several other CSOs. The Hon. MP for Ho West, Mr. Emmanuel Bedzrah, while commenting on the proposed order of business for next week in Parliament lamented the slowpace the RTI Bill has taken in the House, as he drew the attention of his colleagues to the presence of CSO heads in the gallery to observe proceedings in relation to the Bill. 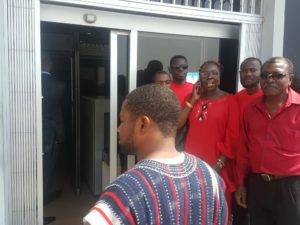 The over 3-hour stay in Parliament was furthur marred by a bizzare action by some security persons at the entrance of the public gallery who denied Mr. Alex Tetteh and his colleague from the Centre of Employment of Persons with Disabilities access to the public gallery because they claimed these PWD's can not be on their feet when all persons in the Chamber are to rise for the Speaker's procession or recession. This attracted a lot of media interest and widespread condemnation from the CSO heads present.